First of all, my lighting is bad. 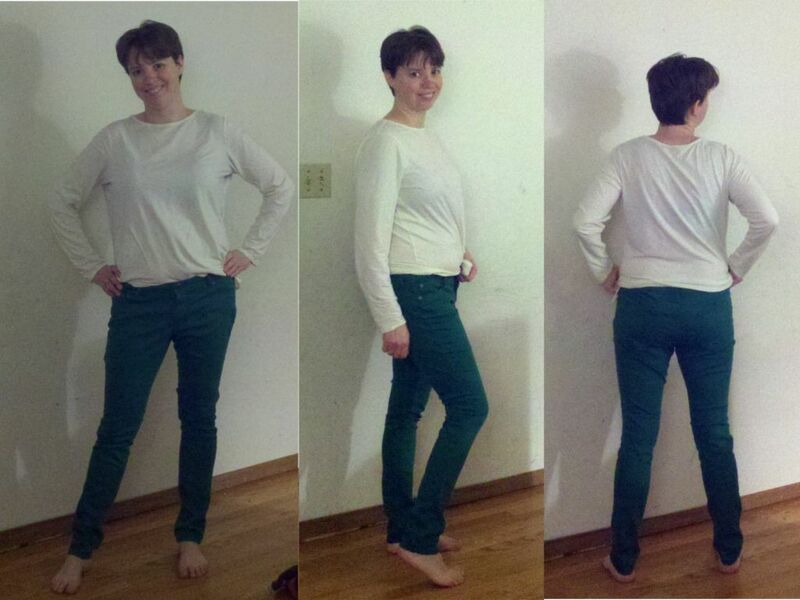 These jeans are a vibrant bright kelly green. They're almost identical to my red ones (except that the quality is lower and the denim thinner). What do you think? Do they fit properly? Do I get to keep them? And this Moto. I'd call it a taupe-ish? It's silvery shiny fake leather, and wrinkled (on purpose - so RATE). Does it fit right? I'd wear it open. Do you think it would go with my other clothes? Is it edgy - I think my perfect moto should be? I'm really iffy on this one, and just not sure what I think. I don't really want to add it to my wardrobe if it's not a 10 or darn close. And I'm honestly confused on this one. I like it, but is it great, or just okay? Sorry for my absence from the forum this week. I've been flooded with things that must be done NOW. I've tried to lurk a bit, but mostly failed even at that. It may be next month before I'm back regularly, though I'm trying to keep up on taking pics, so might post them now and then. A few years ago I went through a "fashion designer" phase, where I designed and sewed up clothes. I entered them in contests and even placed twice. It never occurred to me to actually wear these though. Never. Fast forward to this forum, and I've recently seen Deborah wearing some wonderfully dramatic yet simple, stunning pieces. And I thought - "wow - it's too bad that sort of thing never shows up at thrift stores! ", followed by "hey wait - I could sew that!". So here's my first attempt at a top inspired by Deborah's style. I have a few fit tweaks to make (the shoulders are too wide), and a few style tweaks to make (the high-low hem is too severe - and too short in the front, and maybe too long in the back). But overall, it was a fun experiment, and I'll probably make a second, and even a third or fourth version of this top. (It might take me that many tries to get what I want). I'd like to think that maybe I'll even wear it this summer! Thanks for the inspiration Deborah! 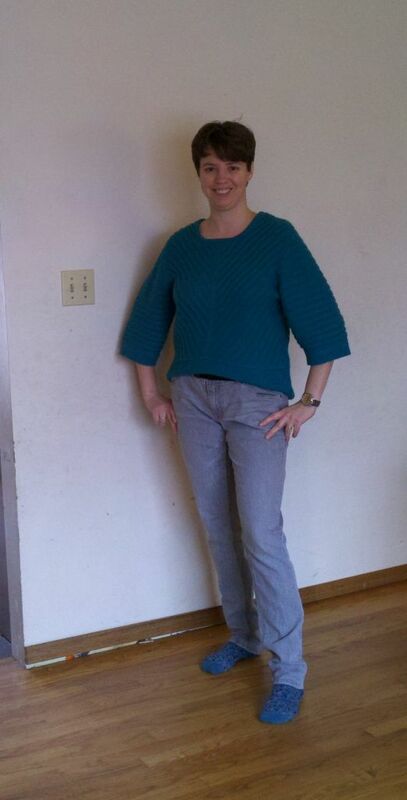 These are the "jean leggins" I got from Target on clearance yesterday. 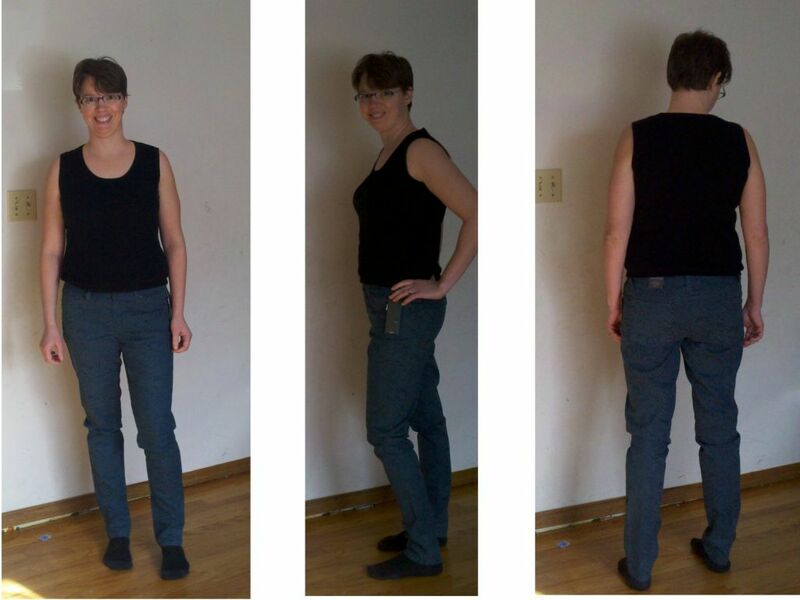 They're 2 (#1) and 3 (#2, #3) sizes up from my normal, so they fit more like skinnies than jeggings, I think. (I hope). What do you think? How do they fit? Do they deserve a place in my closet? I'm surprised at how solid they read - the print really is quite subtle. They're totally returnable, and probably at least one pair or the blue (#1 and #3) should go back. #1 is teal snake-print, 2 sizes up. #2 is black snake-print, 3 sizes up. #3 is teal snake-print (same as #1), but 3 sizes up. for $8. I couldn't bear the thought of missing them, so I bought both the teal and the black. I bought 2-3 sizes up so they're not so skinny, and will take K/R pics tomorrow. b) do they grow with wear? Can I expect them to bag out over the course of the day? Also, do you see this sort of jean (tone-on-tone snake print) as still reasonably "in" next fall, or are they on their way out? I so thought it was spring last Saturday when it was nice and warm. Then the worst storm of the winter hit. Joke's on me, because I boxed up all my super wintry clothes Saturday afternoon. Oh well. #1 What I wore for boxing up clothes. I found this sweater languishing (in the probation box), and loved it. So it's resurrected as "cold spring" wear. #2 To church. It would look better with blue booties. I did a light pink shiny lip, and liked it. #3 Today - Black and blue - A black shell and black trousers with yesterdays chambray over top. The shirt has the top few buttons open, so more black shows at the neckline than looks like in the pic. All feedback and suggestions more than welcome! #2 too formal: black pants and sweater, poppy top. Will probably wear this to church. #5 bootcuts with stripes and orange jacket. This is what I wore. 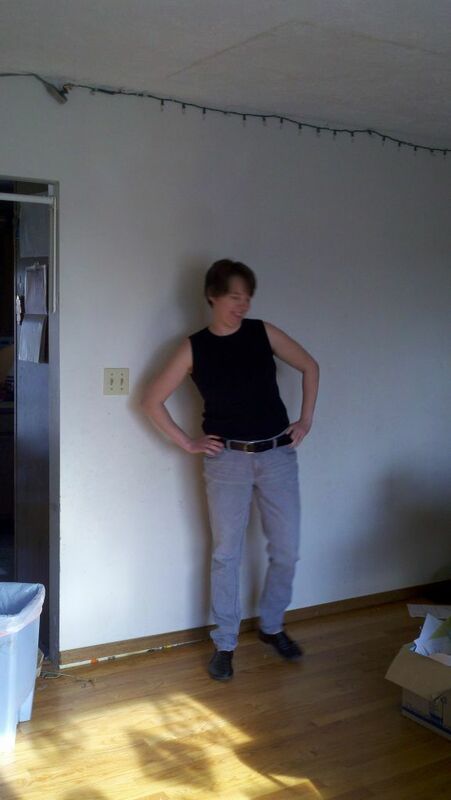 #6 What I wore (without jacket) - this is how I wore it most of the time. #8 WIW yesterday for working from home. It's pretty "meh". I won't repeat it, I don't think. I visited goodwill last night, intending to check out shoes, and came home without shoes but with some new clothes. They're returnable for 2 days - which should I keep, which return? #6-7-8 a black dress. I'm imagining it for winter, with booties and a bright jacket (like my houndstooth one here). While Spring seems like an eternity in coming, I decided to follow Jill from goodlifeforless.blogspot.com's lead and re-enjoy some of my favorites from winter, and some things I wish I'd worn more. And since it's still frigid and I'm sooo cold, I'm piling on the layers. #1-2 sparkly aqua sweater with olive pants. I'd wanted to wear both of these piece more. So I put them with the leopard belt and burgundy boots. I was cold so I added the red jacket - it doesn't quite bookend the shoes, since they're not bright enough. And I think the combination - red, green, blue and leopard might be a bit ALGO. #3-4 red jeans with brown. I loved my red-brown outfit from a few weeks ago so much that I tried it again. This time with a longer brown short-sleeved sweater over the long-sleeved one. (It was warmer that way). I'm wearing the leopard belt again, but I see from the pics that my semi-tuck isn't high enough in the front to show it off. I'm also wearing my super-old tall brown boots with the wobbly heels. My ankles are getting stronger, and I'm not wobbling in them as badly as I used to. I think I'll keep these for a while yet. However, the longer short-sleeved sweater is pilly, and I think it'll get tossed unless a shaving rescues it. I think I'll keep this up the rest of the week - hold off on my spring items in favor of giving the winter ones a final loving. Sorry for the poor lighting. I really need to start going outside for pics again. #1 Worn for church yesterday (but the pic is from "trying on" outfits - when we actually went to church, I had makeup and reasonable looking hair. #2 Trying out the big-neck pullover over buttoned-up shirt from Angie's post last week, and the denim-on-denim formula. And white shoes for spring trends :) I didn't end up liking the outfit though - not enough color for today. #3 WIW today instead - subbed white for green. Much happier. #4 Worn Saturday for cleaning the house. Preface: This is long winded. Don't read if you don't want to :) I'm just asking for suggestions on why these don't work. I figure that I may as well share outfit failures in addition to success - perhaps you can help me understand what's not working about these. Yesterday I slept in and was rushed getting ready, so I reached for a cozy sweater and jeans - a FFBO. I didn't feel like it was horrid (yes, it would be better without socks though), but I really wanted some color in my day. It felt dull and boring. And it didn't feel right. 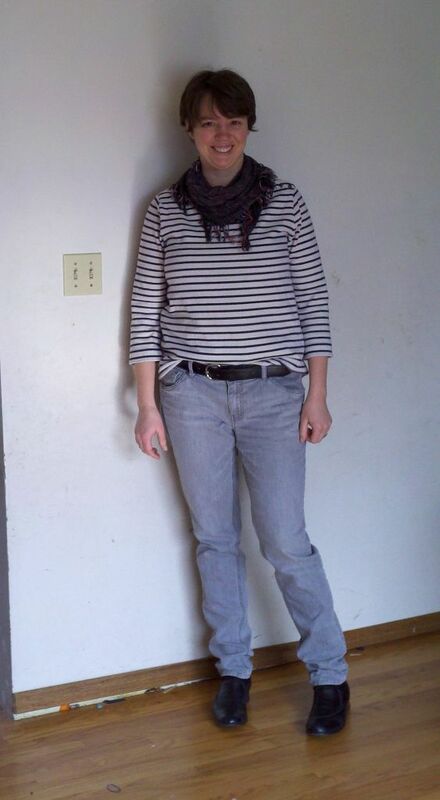 After thinking about it, I thought perhaps I needed a horizontal line somewhere, so I switched to lighter jeans. (#3). The happiness factor went down immediately - it felt like too many trends (ombre+booties+faded jeans), and the bottoms of the jeans didn't play well with the tops of the boots. So I changed back to #2 and have been wearing it all day. But I still don't feel like it worked really well. Some days are just misses, I guess. What should I change? (I'm thinking that this yellow jacket and the gray sweater just don't go together - I just am not sure why). What are your suggestions? Thanks for helping me learn!